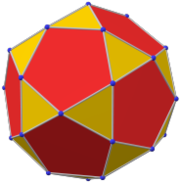 In geometry, the truncated cuboctahedron is an Archimedean solid, named by Kepler as a truncation of a cuboctahedron. It has 12 square faces, 8 regular hexagonal faces, 6 regular octagonal faces, 48 vertices and 72 edges. Since each of its faces has point symmetry (equivalently, 180° rotational symmetry), the truncated cuboctahedron is a zonohedron. The truncated cuboctahedron can tessellate with the octagonal prism. The name truncated cuboctahedron, given originally by Johannes Kepler, is misleading. An actual truncation of a cuboctahedron has rectangles instead of squares. 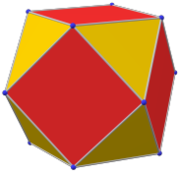 This nonuniform polyhedron is topologically equivalent to the Archimedean solid. There is a nonconvex uniform polyhedron with a similar name, the nonconvex great rhombicuboctahedron. The truncated cuboctahedron is the convex hull of a rhombicuboctahedron with cubes above its 12 squares on 2-fold symmetry axes. The rest of its space can be dissected into 6 square cupolas below the octagons and 8 triangular cupolas below the hexagons. A dissected truncated cuboctahedron can create a genus 5, 7 or 11 Stewart toroid by removing the central rhombicuboctahedron and either the square cupolas, the triangular cupolas or the 12 cubes respectively. Many other lower symmetry toroids can also be constructed by removing a subset of these dissected components. For example, removing half of the triangular cupolas creates a genus 3 torus, which (if they are chosen appropriately) has tetrahedral symmetry. There is only one uniform coloring of the faces of this polyhedron, one color for each face type. A 2-uniform coloring, with tetrahedral symmetry, exists with alternately colored hexagons. The truncated cuboctahedron has two special orthogonal projections in the A2 and B2 Coxeter planes with  and  projective symmetry, and numerous  symmetries can be constructed from various projected planes relative to the polyhedron elements. The truncated cuboctahedron can also be represented as a spherical tiling, and projected onto the plane via a stereographic projection. This projection is conformal, preserving angles but not areas or lengths. Straight lines on the sphere are projected as circular arcs on the plane. Like many other solids the truncated octahedron has full octahedral symmetry - but its relationship with the full octahedral group is closer than that: Its 48 vertices correspond to the elements of the group, and each face of its dual is a fundamental domain of the group. The image on the right shows the 48 permutations in the group applied to an example object (namely the light JF compound on the left). The 24 light elements are rotations, and the dark ones are their reflections. Those between octagons and squares correspond to the 3 reflections between opposite octagons. Hexagon edges correspond to the 6 reflections between opposite squares. The subgroups correspond to solids that share the respective vertices of the truncated octahedron. E.g. the 3 subgroups with 24 elements correspond to a nonuniform snub cube with chiral octahedral symmetry, a nonuniform truncated octahedron with full tetrahedral symmetry and a nonuniform rhombicuboctahedron with pyritohedral symmetry (the cantic snub octahedron). The unique subgroup with 12 elements is the alternating group A4. It corresponds to a nonuniform icosahedron with chiral tetrahedral symmetry. Bowtie tetrahedron and cube contain two trapezoidal faces in place of the square. The truncated cuboctahedron is one of a family of uniform polyhedra related to the cube and regular octahedron. This polyhedron can be considered a member of a sequence of uniform patterns with vertex configuration (4.6.2p) and Coxeter-Dynkin diagram . For p < 6, the members of the sequence are omnitruncated polyhedra (zonohedrons), shown below as spherical tilings. For p < 6, they are tilings of the hyperbolic plane, starting with the truncated triheptagonal tiling. In the mathematical field of graph theory, a truncated cuboctahedral graph (or great rhombcuboctahedral graph) is the graph of vertices and edges of the truncated cuboctahedron, one of the Archimedean solids. It has 48 vertices and 72 edges, and is a zero-symmetric and cubic Archimedean graph. Wikimedia Commons has media related to Truncated cuboctahedron. ^ Doskey, Alex. "Adventures Among the Toroids - Chapter 5 - Simplest (R)(A)(Q)(T) Toroids of genus p=1". www.doskey.com. Cromwell, P. (1997). Polyhedra. United Kingdom: Cambridge. pp. 79–86 Archimedean solids. ISBN 0-521-55432-2. Eric W. Weisstein, Great rhombicuboctahedron (Archimedean solid) at MathWorld. Weisstein, Eric W. "Great rhombicuboctahedral graph". MathWorld. Klitzing, Richard. "3D convex uniform polyhedra x3x4x - girco". This page was last edited on 13 March 2019, at 22:18 (UTC).